The boundaries of music are immense, perhaps boundless. You can literally make music with almost any object. Of course, some objects resonate better or are more mellifluous. Since some ape man thousands of years ago hit a hollow log with a stick and dug the sound it made, we’ve created instruments out of objects. Some of these creations have transcended cultures and time, by being flexible in their application and suited to many playing styles. The guitar and piano are just two examples. It may seem as if we’ve now reached the point of saturation in serious musical instrument invention. Technology and electronics will undoubtedly produce more music making apparatuses, but what about acoustic instruments? The violin, the bongo drum, the sitar, the flute… all instruments invented a really long time ago (like, hundreds and sometimes thousands of years ago). There are still visionaries building new instruments, but it’s the rare one that meets the necessary criteria to be versatile enough and pleasing to the ear enough to “catch on”. I think of musician/inventor Harry Partch and the numerous instruments he built before his death in 1974. They’re all very interesting, but nobody’s really playing any of them anymore (outside of tributes to his works). Anyone for a Quadrangularis Reversum jam session? 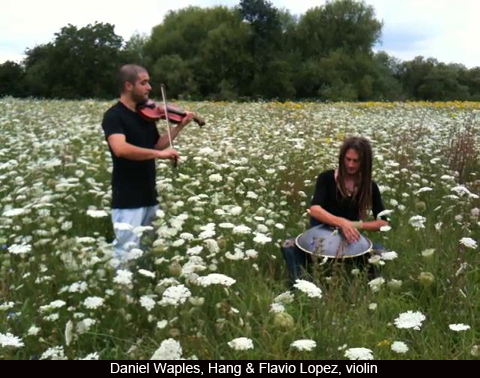 Which brings us to the Hang, also known as the handpan. This could be one of the few new instruments of the last 100 years or so capable of joining the ranks of internationally popular instruments and capable of appealing to a wide range of people. In 2000, two instrument inventors in Switzerland created the first Hang (“hand” in the Swiss Bernese dialect, pronounced “hung”). It looks like a flying saucer, and sounds like a steel drum crossed with a marimba and a tabla. Played with the hands, its resonance and tonalities are deep, soothing and evocative. Price was (and is) a bit formidable, at a few thousand dollars. The inventors take the view that Hangs are works of art, not mass produced instruments. As you can imagine, others saw the demand, took the design and made some slight alterations to create their own variations. Some of them were just what you’d expect – inferior knockoffs. But word gets around in music circles, especially online, and these manufacturers have not found much support. A few other reputable makers are making quality instruments, however. 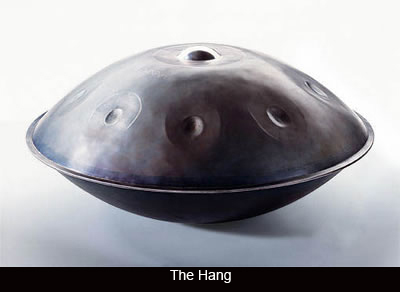 Since Hang is the copyrighted name of the original, PANArt version, the commonly accepted name for the instrument at large is handpan (which sounds a bit like a kitchen utensil, unfortunately.) They’re in high demand due to their novelty, but also because one can create beautiful soundscapes using them in a solo setting, with other handpan players, or with other types of instruments. There are a growing number of musicians who have become sonic explorers with Hangs and handpans and are discovering and sharing what the instrument can offer. You can listen to and download a free compilation produced by HandPans magazine. I don’t know, where you found this false information. This is not how the Hang was or is distributed. If you are invited to the PANArt workshop, you can buy a Hang. There isn’t an interview. PANArt also took orders in 2013. Thanks for your comment. I read this information on various sites on the Internet, but reading your updated official hang blog I see that the information I read may have been false. I will update the post – thanks again. Thanks again – I just took the “PANArt” word off the link.